Schmücke dich, o liebe Seele (Adorn yourself, o dear soul), BWV 180, is a church cantata by Johann Sebastian Bach. He composed the chorale cantata in Leipzig for the 20th Sunday after Trinity and first performed it on 22 October 1724. The cantata text is based on the chorale "Schmücke dich, o liebe Seele" by Johann Franck. Bach wrote the cantata in his second year in Leipzig as part of his second annual cycle of chorale cantatas for the 20th Sunday after Trinity and first performed it on 22 October 1724. The prescribed readings for the Sunday were from the Epistle to the Ephesians, "walk circumspectly, ... filled with the Spirit" (Ephesians 5:15--21), and from the Gospel of Matthew, the parable of the great banquet (Matthew 22:1--14). The German term used in Luther's Bible translation is Hochzeitsmahl, literally "wedding meal". The cantata text is based on the Eucharistic chorale in nine stanzas Schmücke dich, o liebe Seele, BWV 180 (1649) by Johann Franck, thus connecting the "great banquet" from the gospel to the Abendmahl (Eucharist). The hymn is sung during a service in preparation for the holy communion, and imagines a bride getting ready for her wedding. An unknown author kept the text of the first, central and last stanza (1, 4, 9), and paraphrased the other stanzas to arias and recitatives, stanzas 2 and 7 to arias, stanzas 3, 5--6 and 8 to recitatives. He stayed close to the original and did not seek closer relation to the readings than given by the general context. Compared to the early cantata for the same occasion, Ach! ich sehe, itzt, da ich zur Hochzeit gehe, BWV 162, Bach stresses the invitation of God and the joy of the banquet, rather than the possibility of man's failing to respond to the invitation. Alfred Dürr compares the opening chorus and both arias to dances, movement 1 to a gigue, movement 2 to a bourrée, movement 5 to a polonaise. 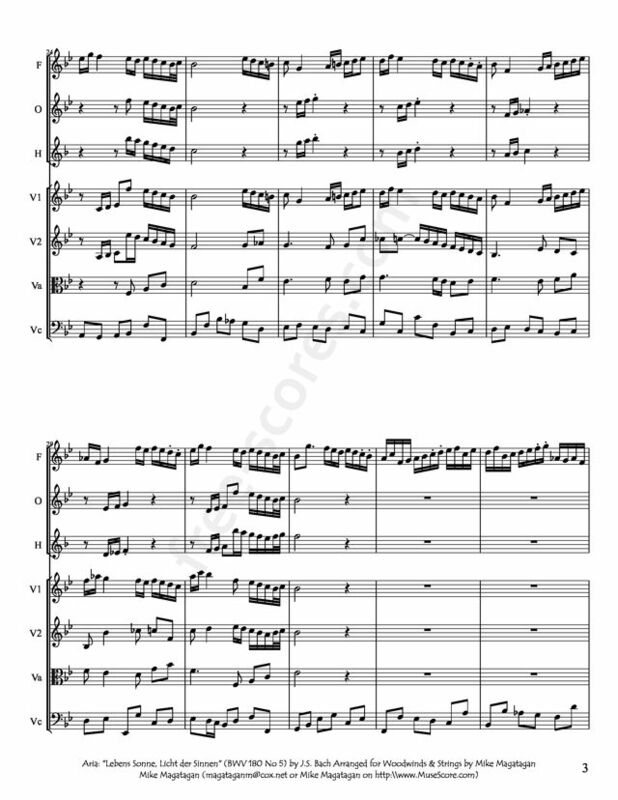 The opening chorus is an orchestral concerto with the vocal parts embedded, the soprano singing the cantus firmus of the tune by Johann Crüger. John Eliot Gardiner sees the "relaxed 12/8 processional movement" as "perfectly tailored to the idea of the soul dressing itself up in all its wedding finery". The following three movements are distinguished by their obbligato instruments. A flute accompanies the tenor voice in movement 2, "Ermuntre dich: dein Heiland klopft" (Be lively now, your Savior knocks). The knocking is expressed in repeated notes. 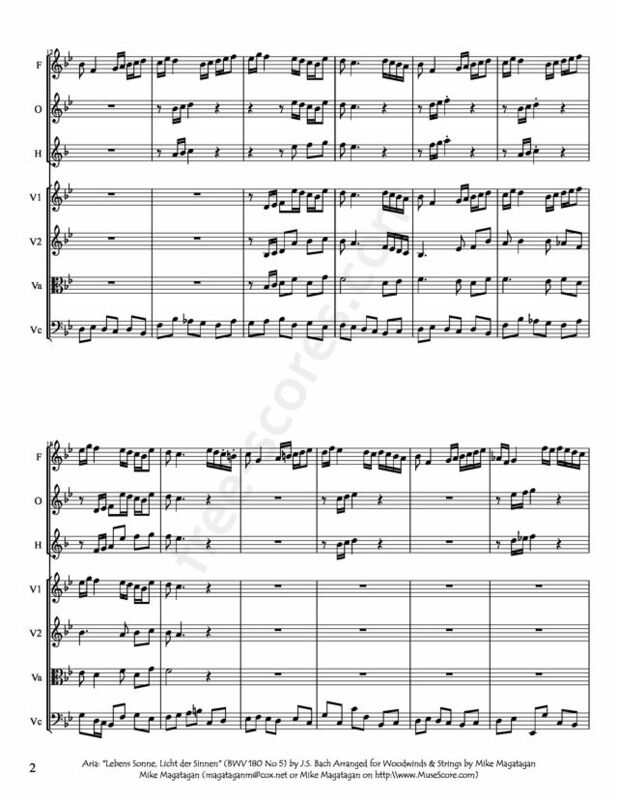 The demanding flute part was probably composed for the excellent flute player for whom Bach first wrote a few weeks earlier in Was frag ich nach der Welt, BWV 94, and then in other cantatas during the fall of 1724. A violoncello piccolo complements the soprano in movement 3, which begins as a secco recitative "Wie teuer sind des heilgen Mahles Gaben" (How dear are the gifts of the holy meal) and leads to the fourth stanza of the chorale, "Ach, wie hungert mein Gemüte" (Ah, how my spirit hungers), sung in a moderately adorned version of the tune. In movement 4, two recorders reflect the text of the alto recitative which develops to an arioso, with the recorders first playing just long chords, then gradually adding movement. The full orchestra supports the soprano in the second aria "Lebens Sonne, Licht der Sinnen" (Sun of life, light of the senses). The last recitative, "Mein Herz fühlt in sich Furcht und Freude" (My heart feels its own fear and joy) is secco, but closes as an arioso on the words "und deiner Liebe stets gedenken" (and considers your love constantly). The closing chorale, "Jesu, wahres Brot des Lebens" (Jesus, true bread of life), is set for four parts. 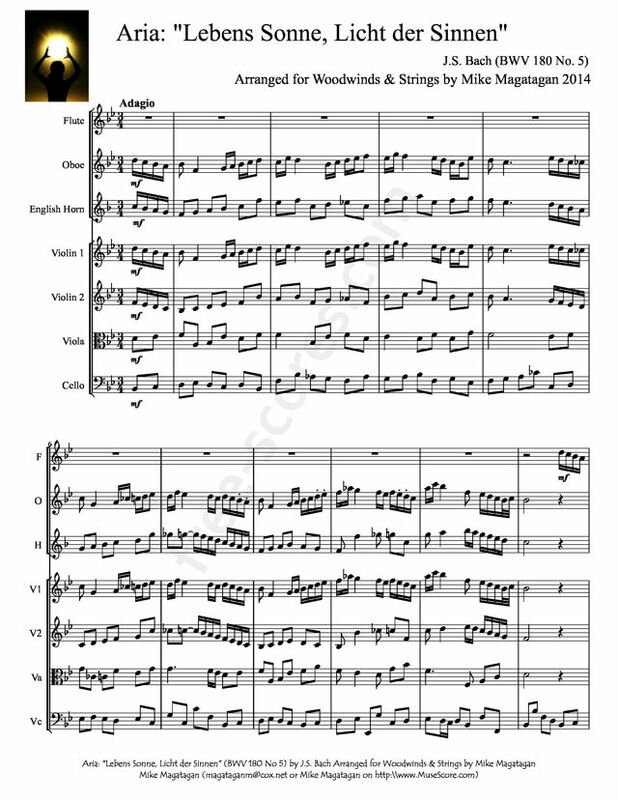 Although originally scored for four soloists, soprano, alto, tenor and bass, four-part choir, and an orchestra of two recorders, flauto traverso, two oboes, oboe da caccia, two violins, viola, violoncello piccolo and basso continuo, I created this arrangement for Woodwinds (Oboe, English Horn & Bassoon) & Strings (2 Violins, Viola & Cello).